This past weekend I got the opportunity to drive with my daughter, Lydia, from Dayton to Los Angeles. After getting a bachelor’s degree in acting, she decided that it was time to move to L.A. to begin her career in motion pictures. I tried to convince her that Dayton is becoming the new hot bed for making blockbuster films, but she just wouldn’t buy it. We embarked on our journey at 6 o’clock on a Friday morning. Lydia was excited about the new life waiting for her over 2,200 miles and 36 hours away, but she was also nervous. The fear of the unknown is quite powerful. How will the trip go? Will her 2001 Ford Focus make it or will it overheat somewhere in the Mojave desert? How many near death moments will there be with sleepy truck drivers? Will she be happy when we reach Los Angeles or will she want to turn around and come right back to the safety of Bellbrook, Ohio? Is she making a brave life choice or the biggest mistake of her 23 years on Earth? As we traveled through the Midwest, we started to really enjoy our journey. Our stomachs were an hour ahead of central time so we had fish for “breakfast” at 10:30am. We had some fun cracking jokes about town names like Effingham. When we hit an hour-long backup in St. Louis we found time to slow down and take some pictures of the “gateway to the west.” It was the first time Lydia has ever scene this landmark. Once we got through Missouri, the trip got a bit scary. Nobody told us that, once you hit Oklahoma, gas stations on the Will Rogers’ Turnpike are few-and-far between. We got off the turnpike with nothing but fumes in the tank and found a gas station. Had we not gotten off the highway at that moment, we would have missed the majestic buffalo grazing just a few yards away. 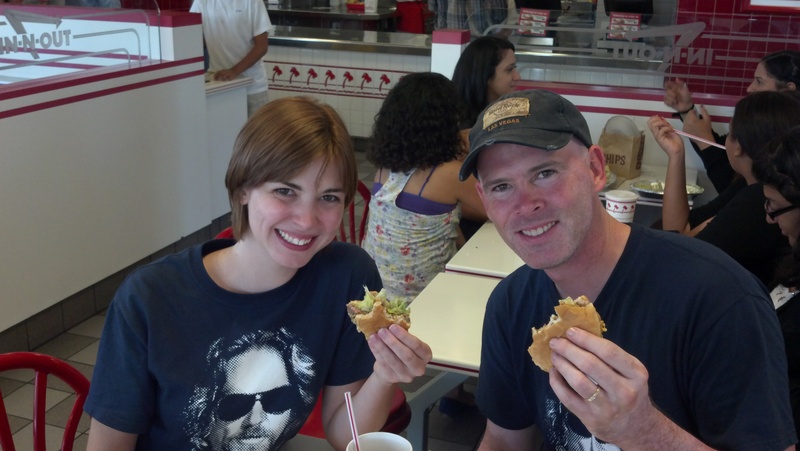 Lydia and I love a good burger. In Tulsa we saw a sign for a restaurant that relatives in Texas rave about: WhataBurger. We had to see what all the fuss was about. As it turns out, we agreed that it was probably the best fast food burger we’ve ever had! As we continued on the trip, it became more and more remote. Once we entered New Mexico, it was very late and the trip was really getting tedious. With the exception of the occasional semi truck that we would wiz by at 75 mph (OK, sometimes 80), there was not much more to see. We realized that we really needed rest at this point, so we stopped at a motel to get a few hours of sleep. When we woke, we realized that we were on the famous “Route 66.” Of course I drove Lydia crazy by singing the Nat King Cole classic for several hundred miles. It hit us somewhere in New Mexico that we were still very far from L.A.. We knew that we would eventually reach our destination, but it was going to take some serious time and effort. Needless to say, some of our enthusiasm for the trip was waning. As we drove through Arizona, we started to feel a sense of hope. We were only one state away from California. We started to see signs of life again as we drove through Flagstaff. Not only were there people and houses but also trees and green grass! We were out of the desert and on top of a mile high mountain. We were going to be able to do this trip in two days instead of the three that we had budgeted for! Once we crossed into California, I expected to see more signs of civilization. What I did not take into consideration was the Mojave Desert. Two hours of nothing. Few travelers, hardly any exits, no wildlife in sight, and barely a telephone pole. Now exhaustion was setting in. Once we came down the San Bernardino mountains, we saw something we hadn’t seen for hundreds of miles. Lights. Street lights, house lights, business lights. After the Mojave Desert, don’t let anyone ever tell you that Barstow is not the most beautiful city in California! The trip from Barstow to Los Angeles would still take two hours, but we were excited to be nearing our goal! Cars were buzzing around us. Gas stations and restaurants were at every exit. Our GPS lead us directly to Lydia’s new apartment in Long Beach. We made it! After unpacking and taking me to the airport for my flight back to Dayton, my daughter is more excited than ever to start her new life as an actor. The trip was long. Sometimes it was fun, sometimes it was a challenge, but it was well worth it. I would do it again in a heartbeat if for nothing else than the bonding experience with my daughter. Well that, and we got to eat at an In-N-Out Burger just a couple of blocks from her new home! How often in business do we embark on a marketing campaign only to give up before we reach out goals? Marketing is not a goal, but a journey. It may seem like you are not getting very far, and sometimes not nearly fast enough, but marketing does have an impact. Every minute of marketing adds up, just like those miles on the road. Be it branding, the building of a social network audience, or search engine optimization, be patient. Enjoy the ride and you will get to your goal.